The Never Summer Ripsaw is the board that started the augmented camber profile with NS and you could now describe it as a stiffer centered stance twin version of the Never Summer West. If you set your stance back in powder then the West is the call but if you don’t then the Ripsaw is the call. Other than some minor tweaks to the flex and top sheet the overall personality of the 2014-2019 Never Summer Ripsaw is very similar. One thing to remember when looking at this camber profile is that wood isn’t 100% consistent so the rocker height can vary from board to board. In general the Ripsaw’s camber profile should be closer to the snow than boards with Never Summer’s Rocker & Camber profiles but again each board varies so don’t freak out if your camber profile is different than ours. The 2016 Never Summer Ripsaw is a little bit softer than previous years models but the 17, 14 and 15 are similar in flex. The Never Summer Ripsaw is for those who are more into taking on the mountain at high speeds regular or switch. It’s an aggressive but forgiving board for how aggressive it is. Conditions: Many days with good groomed snow in the morning that’s pushed away midday to reveal a thin hard block of snowment. I had one day with 8″ of thick Sierra Snow. There was some Rockies Snow and all of it was good. Only had 1/2 day with harder snow and a few days with really good Mammoth groomers. Riders: James, Peter, Jimbo, Mike and a few others. Set Up: Centered approximately 23″ wide 15 front -15 back. Approximate Weight: 156 Ripsaw 6.4 lbs but weights can vary from board to board. It’s wood in the core so no board is consistent with its weight. Flex: The NS Ripsaw is pretty stiff for a Twin and not really for riders that like to butter and play around. Even with the super easy to butter Burton Diode’s I couldn’t get the Ripsaw to flex underfoot that easy. On Snow Feel: So after reading about this board I would have thought that the Never Summer Ripsaw would of acted like the Lib Tech TRS XC2 BTX but its more aggressive. The profile feels pretty stable for one footing or flat basing which is a nice improvement over their Rocker and Camber profile. What is interesting is you don’t feel your weight on that rather pronounced camber when going straight and it almost feels like a flat to rocker board. However, you get a big surprise when you initiate into a moderate turn or lay into a carve and then it comes to life acting like a springy camber board. It’s definitely a solid departure from the old Proto and still a step up in terms of aggressiveness from the Proto Type II. It wants to go fast and it wants you to lay into a carve regular or switch but it doesn’t freak out if you want to mellow out and skid turns either. The crazy thing is a board this stiff shouldn’t be this forgiving for a twin with a freeride flex but this camber profile allows you to be more adventurous with less consequence than most boards of this flex will allow. Turn Initiation: It’s very quick edge to edge and feels like a flat camber board until you lay into a more aggressive turn or a hard carve and then it becomes a completely different board. Skidded Turns: It’s a lot easier to skid turns than most aggressive boards which are a real bonus. I think that’s why a lot of riders like this board because if you get off your game you can just skid out and stop. Carving: It holds a carve much better than the old Rocker and Camber profile boards and it’s right there with many camber dominant boards out there. I couldn’t get the Ripsaw to wash out and I didn’t have to swing my knees wide to put pressure on the tip/tail like I have to do with Rocker & Camber boards. I could get more of a surf style lean back on the tail at the end of a carve and let the board’s camber spring me out of the turn. It was just a little bit shy of a good true camber board and one of the better hybrid rocker boards I have carved with. Edge Hold: Solid grip just like all NS boards. Really holds an edge without being overly grippy in softer snow. Not an ice specialist but will handle most conditions the average rider experiences without issue. I’ve been a big fan of the Vario Grip sidecut for a long time and this is no exception. Speed: Very fast and damp for a 156 twin. It kind of felt like someone mistakenly cut out a freeride board into a twin. I had some perfect uncrowded morning groomer days to bomb and the Ripsaw made me feel very comfortable at higher speeds. It can be a little bit unstable because of the tip/tail are lifted off the snow but it tracks a lot better than NS’ older Rocker and Camber profile. Uneven Terrain: As the days get chewed up and bumpy I felt more than I normally do with the Ripsaw than I do with their softer flexing boards. Slower speeds aren’t as playful, shock absorbing and easy but for such a stiff damp board it’s better than you would think. It hammers through chunder well at higher speeds. Powder: With the thick Sierra snow we had the Ripsaw was fine but anything over 1.5 feet we would all much rather be on the Never Summer West due to its slightly directional shape and set back stance. You can’t set it back as much as you can because of the centered stance. If you ride switch a lot in powder this won’t be an issue and it floats better than a lot of aggressive mountain freestyle boards we enjoy like the Hot Knife, Arbor Coda Camber, and Rome Agent Rocker. Switch: Practically perfect either way. If you like riding switch at a higher speed then here you go. The only thing that would be better is the Proto Type Two if you ride duck and centered. If you don’t then the Ripsaw might favor your riding style better. Jibbing: Being a little stiffer than the Proto Type Two and West which aren’t perfect jibbers to start with, the Never Summer Ripsaw is more suited for pipe and bigger kickers. As the board softens up over time it’s going to be better but it’s no Funslinger or Peacemaker. Pipe: The Never Summer Ripsaw has more of a camber drive wall to wall while still being more forgiving than camber. We only had a few runs in the pipe but I liked how it felt and would love to lap the pipe with it. Jumps: The Never Summer Ripsaw snapped into the air on an ollie very easy and felt very stable on the small kickers I hit. This feels like it’s more at home going bigger and it feels like the extra camber could help you pull off an awkward back seat landing better than the Rocker & Camber boards. It’s still fine for smaller to medium jumps and has a pretty forgiving feel here for how aggressive it is. I often took the Never Summer Ripsaw up with the Lib Tech TRS XC2 BTX since their hybrid rocker profiles with augmented camber are similar. They also have that same centered stance twin shape. They both have a very fun personality underfoot but it seems like the NS Ripsaw was more fun to push it at higher speeds and has a little more spring out of the turn when carving. Compared to the almost traditional camber Lib Tech Hot Knife it’s a more mellow ride due to the tip/tail still being lifted off the ground where the camber touches the snow with the Hot Knife. A lot of Never Summer fans will be deciding between the Ripsaw, West and Proto Type II. The Ripsaws Flex is a little stiffer than the other boards but all are about the same when it comes to speed. The Ripsaw will be more work to butter though. The Type Two’s Asymmetrical Shape will be for those that only ride centered/duck and ride switch as much as they do regularly. The Ripsaw is pretty close to the Proto Type Two but doesn’t mind if you don’t duck it out. It also doesn’t mind setting it back but with a centered stance you can’t set it back much or at all depending on your stance width. The West doesn’t have as good a switch experience as the others but of the three it’s the best one board compromise for those that want directional float in powder and a centered experience on groomers/park. All in all the Never Summer Ripsaw is a good board that wants a twin that can be aggressive when you want it to be but still be catch-free and not have a consequence when you get off your game. However, if you are looking for something you can set back more on board the Never Summer West would be the better call. We try to get as many images of the Never Summer Ripsaw, but forgive us if they're not all there. That is, until the Ripsaw came out. I saw the specs, and had a strong feeling NS was shifting in the right direction, then rode it for a year, and it didn't disappoint. It has all the advantages of a twin tip, rocker/camber board, with none of the disadvantages. The days of needing multiple boards are over. Even at my height and weight, the 157 X has no issues floating in the fluff, zig-zagging through the trees, buttering around, going full bore in the superpipe, hitting the kickers, or getting the armpit on the ground digging a canyon for the skiers to lose ski in... forward or switch. The board is a true point and shoot. Stability is amazing flatbase or in turns of any size. Again, it really bridges the gap and offers all that playful fun of rocker/camber, while removing the disadvantages. If I have to give it weaknesses, here are two: 1) Weight. It's a Never Summer, its heavier than many other brands, though swing weight is minimal. 2) High speed stability and edge grip in hard snow aren't quite as good as a high end camber board, but after a few months on the Ripsaw, I tried riding my pre- rocker/camber NS Evo X and it was so restrictive. Always wanted to be locked into an edge, unforgiving, forced lack of style, and....honestly reminded me of taking a lunch break and swapping out my old Fester 157 to an F2 Beamer race board - Could really lay down the diggers, but that's about it. If you are a stronger, heavier, more powerful snowboarding who enjoys aggressive, high-speed all-mountain/all-conditions riding while centered and duck footed with a good dose of pipe and air - if you like cheek sagging G-forces but also want the freedom to chill out and goof off, this is the best hybrid (that I have tried) to date. Board is great for fast aggressive rideing. It will spring you out of turns and has great edge hold. Board does well in powder and in harder snow condition. 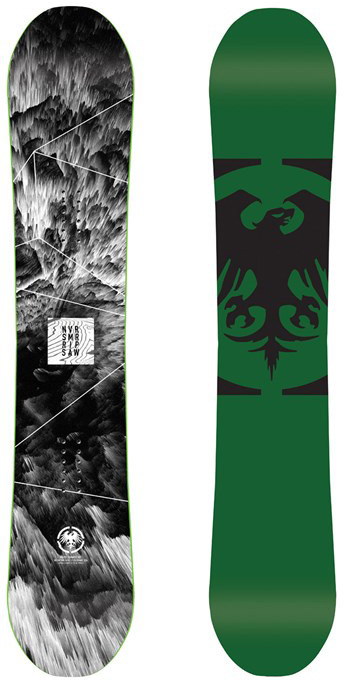 For deep powder I like Never Summer proto hd better just because it has more rocker, less camber, and it is softer. I love my Proto Type Two but after the board was broken in and conditions started softening up a bit, one big problem appeared with it...it rides a bit rough on chop/chunder. That limits my speed and wears more on my legs. Enter the Ripsaw. I knew that I needed a stiffer board for chop, and I was right. Compared with the Proto Type-Two on the same softer choppy conditions, the Ripsaw made riding fast much more smooth. I have noted in firmer conditions that the Ripsaw has a bit less edge hold than my Proto Type Two like the review noted, and I'm pretty sure that this has due to the stiffness of the board. With the same Ripsaw profile and vario edge effects, you would expect it to be the same, but the issue is that you mostly slip out on ice and hard pack when carving deeper, and the Proto Type Two flexes more and allows more surface contact in these harder conditions than the Ripsaw does. So the Proto Type Two is still without a doubt my favorite ice board, something that you need in your quiver in the Northeast. The Ripsaw however is now my go-to board for choppy conditions, and I expect edge hold on hard conditions to improve as it breaks in a bit more. As far as stiffness goes, I would say that the Ripsaw is a 7 brand new and I'm not sure how much it will break in, but it's a pretty damn beefy board (thick and moderately heavy). My Proto Type Two was about a 5+ brand new, but is now around a 3.5 after 35 days of riding it. Note that I do 30-40 miles a day when conditions permit, so YMMV. Besides the obvious loss of butter ease with a stiffer board, the only changeable things that I don't really care for in this board is the longer nose and the matte topsheet. I prefer a snubbed nose like on the Proto Type Two. Maybe it helps slightly in deep powder, but I won't be riding this in deep powder, and most of the time we're riding groomers or the chopped up aftermath anyway. The topsheet on this has a more grip than most other makers, but this one marks up easy given it's flat matte finish, and it also holds more snow. The Proto Type Two has the perfect topsheet as it is grippy, it doesn't cause excessive snow to stick, and it is very resistant to being marked up. I used to ride the old Never Summer Proto before i came across the ripsaw. Never really had stiff boards before. So when my shop agent gave me this to try out I was a pretty curious. First day, so pumped! This board gives you so much control when going faster. It really gave me the confidence to hit bigger jumps than ever. Yes, it is pretty stiff. But if you have the phyisical abilities to push it, you can ride anything with it. I'm a snowboard instructor and this was/is my everyday board. So far it had 250 + days on snow over 3 seasons. Usually my boards don't last that long. It definitly lost some pop over time, but nothing too bad, I still ride it for most of my days. If you are looking for a long-lasting, hard-going everyday All-Mountain board. This is your choice. Coming from a traditional stiff camber board I was looking for something more playfull but still agressive. After looking for hours at this page I found the Rip saw and the review sounded really exciting to me. I live in the north of Germany with almost no snowboardshops so I had to trust the goodride team again and ordered one! I never realized a board this stiff that could carve this hard could be so easy to turn. Coming from traditional camber and hybrid camber boards I thought significant camber was necessary to really load up a carve, and was worried hybrid rocker would feel unstable. This thing feels like the best of all worlds. I have the 159 and it is super easy to whip back and forth in tight areas while also carving brilliantly and feeling very stable going really fast. Haven't had it in powder yet and I don't spend much time in the park, but it was really fun everywhere else including launching off of natural kickers here and there. Highly recommended.